CSUSB students were welcomed to attend this quarter’s Late Night with Pride in the student union. The event was held on April 7, and was a warm welcome back for new and returning students at the start of the quarter. The night consisted of watching movies, hanging out with friends and enjoying great food with pizza and snacks aplenty. Many students settled themselves in by lounging around on the couches and chairs provided. 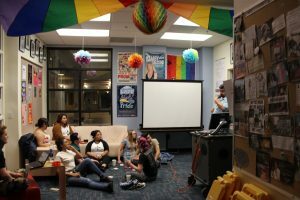 The social interaction was a great investment for all diverse students to make friends with great people, and advocate their beliefs that coincide with what the Pride Center stands for. Being one of several events they hold throughout the quarter, Late Night provides eager individuals to share their stories while being supported from the community our school has made. Students are allowed to share intimate details about their lives while being in a safe environment that advocates support toward all CSUSB students. My favorite part about attending this event was the warm welcome they provided. It was also a fun place to hangout for those who enjoy playing the card game, Cards Against Humanity. If you want to make new friends and raise awareness of the LGBTQ community, the Pride Center is a great place to start. Lisseth Reyes, one of the hosts for the event, came prepared with snacks and games for attendees to have a fun night. “Just because it’s Late Night with Pride, doesn’t mean we are exclusive,” said Reyes. Students from all diverse backgrounds were welcomed to attend the event, with over 20 diverse backgrounds coming to the event. The students were able to interact with other people they may have not known, although see each other every day. Miguel Rivera, a student who attends San Bernardino Valley College, was among several that were here to encourage a healthy community spanning the boundaries of this university. “I live close to Cal State, so knowing there are events like these occurring in our city helps bridge our community closer, similar to what a family should have,” said Rivera. For those interested in being provided resources and making friends along the way, they are located in the Santos Manuel Student Union in room SU-113.